First Year Students, Exam Hall Tickets are ready for generate. Today (28.12.2013) onwards, Eligible Students can collect your hall tickets from your college exam cell. The following instructions are also printed in the Back Side of your hall ticket. 1. Admission to the Examination is provisional. 2. The Hall Ticket is issued subject to the candidate satisfying the Attendance and other requirements as per Rules, Regulations and Instructions by the University from time to time. If later, it is found that the candidate fails to comply with the above requirements, the examinations written by the candidate will be treated as cancelled. 3. A seat marked with Register number will be provided to each candidate. Candidate will occupy the allotted seat at least 10 minutes before the commencement of the examination. In no case, candidate shall be allowed to occupy a seat other than the seat allotted to him. 4. Normally the Candidate will not be permitted to enter the hall after the commencement of the examination.Only on extraordinary circumstances, the candidates will be permitted during the first thirty minutes of the examination after obtaining the written permission from the Principal / CS. Under any cirucumstances the Candidate shall not be permitted to enter the hall after the expiry of first thirty minutes. 5. Candidate shall not be allowed to leave the examination hall before the expiry of 45 minutes from the commencement of examination. The candidate who leaves the examination hall during the period allotted for a paper will not be allowed to re-enter the hall within that period. 6. Candidate who is suffering from infectious diseases of any kind shall not be admitted to the examination hall. 7. Candidate is strictly prohibited from smoking inside the examination hall. 9. Candidate is required to bring his/her own pens, pencils and erasers. Candidate should use only blue or black ink while answering his/her papers. 10. Before proceeding to answer the paper, the candidate should write his/her register number, semester, subject and date of the examination at the appropriate space provided in the first page of the answer book and nowhere else in the answer book or in any additional attachment like drawing sheet, smith chart etc. 11. If a candidate writes his/her register number on any part of the answer book/sheets other than the one provided for or puts any special mark or writes anything which may disclose, in any way, the identity of the Candidate/College, he/she will render himself/herself liable for disciplinary action. 12. Writing of wrong register number in the answer book will entail rejection of the answer book. 13. Candidate is not allowed to exceed the prescribed time assigned to each paper. 14. Candidate shall not talk/ask questions of any kind during the examination. 15. Candidate shall not carry any written / printed matter, any paper material, cell phone, pen drive, ipad, programmable calculator, any unauthorized data sheet / table into the examination hall and if anything is found in his/her possession his/her shall be liable for disciplinary action. 16. No Candidate shall pass any part or whole of answer papers or question papers to any other candidate. No candidate shall allow another candidate to copy from his/her answer paper or copy from the answer paper of another candidate. If found committing such malpractice, the involved candidates shall be liable for disciplinary action. 17. Candidate found guilty of using unfair means of any nature shall be liable for disciplinary action. 18. Candidate will have to hand over the answer book to the Invigilator / Chief Superintendent before leaving the examination hall. 19. Candidate should produce the hall ticket on demand by the Invigilator / Chief Superintendent / Anna University Representative / Squad members. 20. Candidate shall not write anything in the Hall Ticket. 21. Candidate shall write only the Register No. in the space provided in the Question Paper. Any other writings in the Question Paper is prohibited and punishable. * Examination for the subject GE6152 Engineering Graphics is scheduled on 08/01/2014 (Wednesday) (Forenoon & Afternoon). The session for the subject for various branches will be announced by the respective colleges. 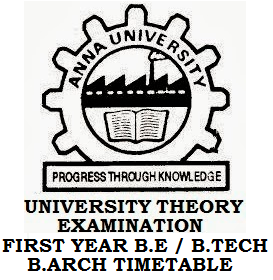 Tamil medium students will take the Examination in the Forenoon session only.